The corn is turning a light shade of brown and the cool evening breeze rattles the soon to be falling leaves. For me that can only mean one thing here in my home state of Illinois…deer season is upon us! During my early years of bow hunting I always looked past the early season while wishing the rut would hurry up and get here, but about 15 years ago that all changed after I planted my very first hunt over food plot and saw the immediate results. The early season pictures I was getting on that plot during the afternoon and early evening hours was enough to change my mind and make the early season one of my favorite times to be in a tree. There are ways to increase your odds and ways to decrease them and over the past 15 years I have definitely learned a lot from my mistakes and hopefully sharing some of those mistakes will help you avoid them during your hunts and help you fill that buck tag before the cold weather sets in. 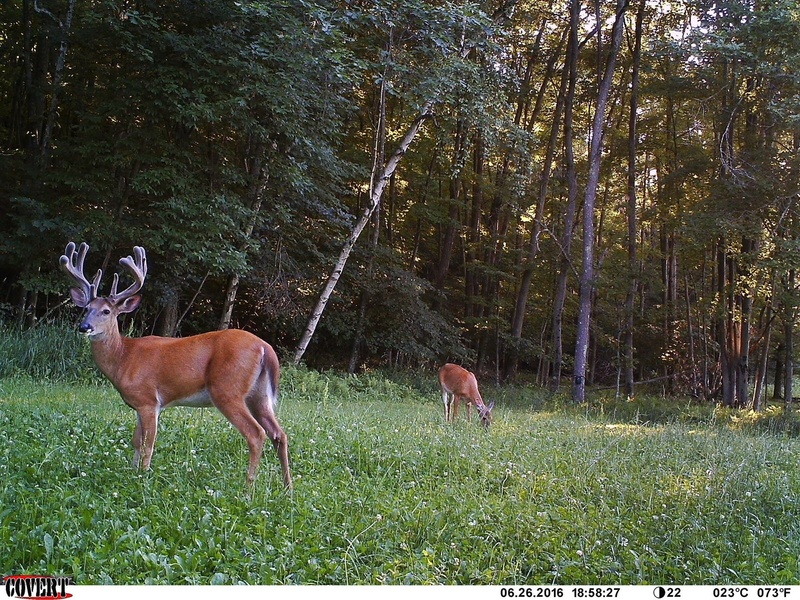 To better your odds you need to do your homework early and by early I mean starting right away in the Spring (April), if you are able to plant food plots this is a great time to get some of them in the ground and begin to get cameras out. My early season plots are typically going to be Trophy Clover Mix, Game Changer Clover Mix, Chicory and Mini Max. As they provide year round food sources high in protein and nutrients and seem to be the best way to begin to pattern my deer for the early season. For those of you that don’t have the luxury of planting food plots you need to get your cameras hanging by a mineral site, high protein feed or in states that don’t allow mineral/baiting a water source or a food source such as an Ag field. This strategy will allow you to get an early look at what’s currently on your property. If you’re a little late in the game and just preparing for season now, there’s no time to waste…but fortunately you still have a little time to get a quick Fall Food Plot established (Lights Out, Honey Hole, Fall/Winter/Spring, etc.) 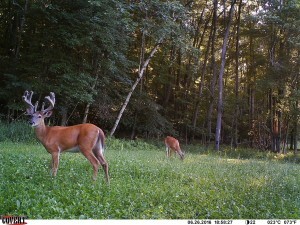 or a Mineral/Attractant site to take an inventory and prep for the Fall hunt. Giving your deer a reason to be on your property and moving during daylight is important when hunting in the early or late season. The worst thing people do (and I was one of them) is to check their cameras too frequently, I have found that checking certain cameras once a month has shown me an increased success rate in my early season hunting. The more you are disturbing the natural movement of your resident deer herd the more likely they will be to become more nocturnal or seek safer shelter elsewhere. During the hot Summer months a whitetail deer won’t travel very far from their key food and water sources and the more you’re in their bedroom checking trail cameras the faster they will catch on and find a safer place to hide. Big deer get big for a reason, so be careful not to push them out of their home range before season even begins. For a many years I hung my stands right over a food source and in many instances I still do, but you need a game plan to make it as easy and as quiet as you can to leave your stand after an evening hunt without spooking the deer that may be feeding in that plot. I have found that hanging my stands close to a food and water source on a trail going from a bedding area to a major food or water source has increased my chances and has made it easier for me to exit my stand with minimal to no detection. Planting a Cover Screen like Antler King’s Shield and Bedding Plus (that lasts a lifetime) is a great way to hunt a field edge and safely enter and exit undetected by feeding deer. Every September I found myself scratching my head and in a major panic. It seemed from the end of August into early September some of my regular bucks would disappear from my trail cams and I would start to go crazy and wonder where they are and what happened to them…I’m sure every hunter out there can relate. While some people may not believe me, I’m convinced that when a buck loses his velvet and goes hard antlered he becomes more territorial and his patterns change. As a result, I have started setting trail cams up in early August in areas that I normally wouldn’t…such as lightly traveled trails and into the thicker parts of the woods to see if they stayed on my property or moved on, after I put those cameras up in early August I will leave them alone until the middle of September before I will check them again. What I’ve found is that I haven’t “lost” some of my regulars, but they’ve moved to their Fall range and have become more territorial and weary since shedding their velvet. Another great tool to utilize is glassing from a distance. If your property has Ag fields or pastures around it, spend some time glassing from your truck during the evening hours, it is a great tool to locate deer on and around your property without disturbing their current pattern and may help you select the perfect early season stand location depending on their current habits. As deer season begins to open up around the country I can’t wait to get into the stand, I hope some of my past mistakes will help you better prepare for the upcoming hunt and help you fill your tag during the early season. It’s not too late to take the necessary steps to increase your odds this season and it’s never too early to improve your hunting tactics for the many hunting seasons ahead. Best of luck this Fall! That is actually our Game Changer Clover Mix. Which is a 3-5 year blend of clovers that is very pH tolerant, shade tolerant and easy to use and plant. It can be successfully sowed in the Spring or late Summer.